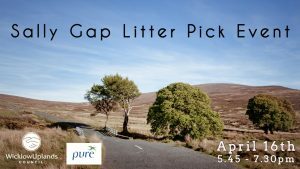 Wicklow Uplands Council invites you to join a litter pick event along a stretch of the Sally Gap on evening of Tuesday the 16th April. The event is being organised in conjunction with PURE Project, An Taisce National Spring Clean and the National Parks & Wildlife Service. The route will begin at Kippure Adventure Centre and head along the Sally Gap Road (R759) adjacent to the Coronation Plantation till the well known Sally Gap crossroads. All volunteers are welcome and should meet at 5.45pm at the Kippure Adventure Centre. We would suggest that volunteers dress appropriately for the weather and if possible to also bring a pair of gloves. All bags and litter pickers will be provided. For further details please contact Brian Dunne at bdunne@wicklowuplands.ie.